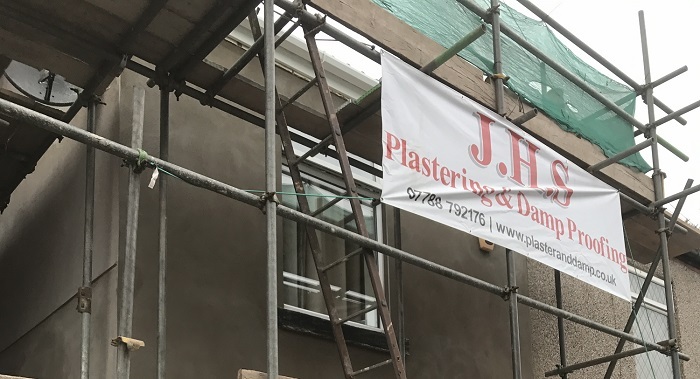 So as it was clear that the guys had no idea what they were doing as no sheeting down had been done and tyrolean was all over the brickwork of the house all over the windows, all over the floor the customer asked them to stop what they were doing and leave site. The scaffold was taken back down and the customer was left with a right mess as you can see from the picks. So after a couple of meetings with both mother and daughter they decided to go with us for just flat render. So our scaffold was erected and we began to chop off the mess of tyrolean which was left by the other firm. We managed to get it back to the brick, we clipped back all the loose cables that were hanging we even spent a few hours scraping and cleaning the windows as I just felt so sorry for the customer. But we managed to get all the windows back to something like and tried our best with the brick work , the client was over the moon to say the least. So we put all the new beads on and put the scratch coat on all elevations. We then spent the second week putting the top coat on for the finish product. The client was over the moon when we had finished. I think we just about reassured her faith that there is decent tradesman out there bless her..